Have you ever wondered how scientists study birds? Sometimes counting birds on a walk through the forest reveals all that a researcher needs to know, such as our monthly bird count. Other times, it helps to get a closer look to identify or mark birds with small bands. For this purpose, fine nets, or mist nests, are set up to capture birds. 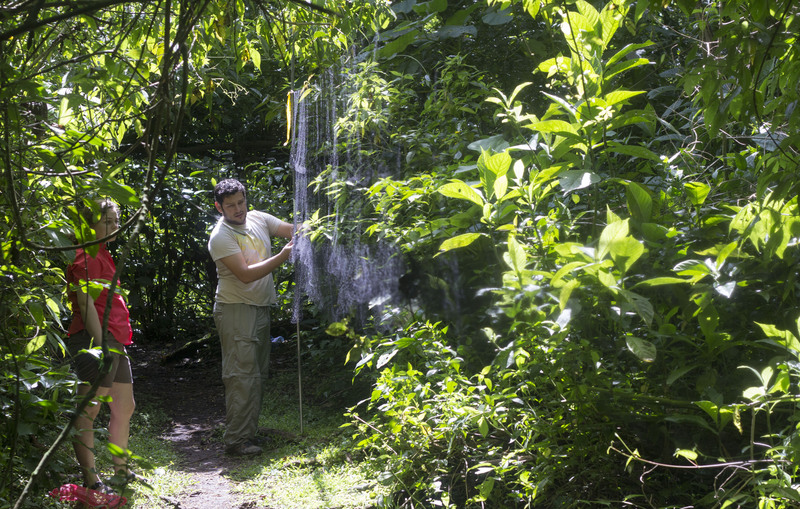 UGA Costa Rica’s head naturalist, Arturo Cruz Obando, led our resident naturalists in an exercise in bird mist netting to gain experience with this method. They previously used mist netting to identify bats on our campus trails. After setting up the nets along an open space along the trail, we checked back every fifteen minutes to see if we had captured anything. While wearing gloves, the best way to untangle the bird from the net is to start by holding the feet and then working to clear the wings and head with care. The naturalists had a wonderful time learning about mist netting with birds. What a pleasure to see and hold these birds up close! Caley Zuzula and Sandy Neps look for identifying characteristics of a captured bird. Caley Zuzula holds a Plain Wren. This Golden-crowned warbler was caught in the mist net. Head Naturalist Arturo offers directions to remove the bird from the net. Naturalist Sarah Kelehear holds the Golden-crowned warbler.